When filing for a mortgage you need you to share your social security number. 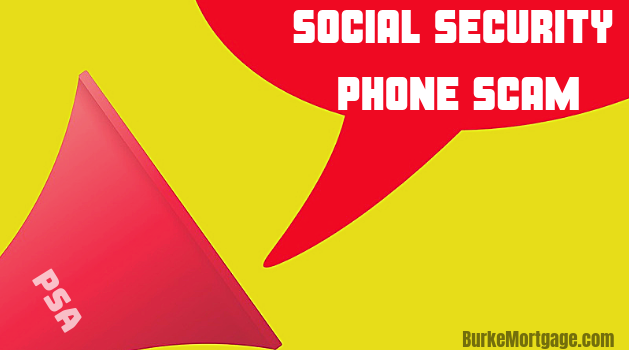 As mortgage brokers, we are very concerned about social security number theft. Which is why we wanted to share this alert as well as some safety guidelines. The FTC article “This is what a Social Security scam sounds like” by Jennifer Leach describes the treacherous scam that has already stolen thousands of social security numbers and millions of dollars! Don’t let them take your SSN! Please check out the article and be warned! “Know Who You’re Dealing With”, i.e. to know the person’s name and not just recognize the company name. Before doing business with a new company – including a mortgage broker, search online for the company’s name with the term “scam” or “complaint.” Read what others are saying about that company. Word-of-mouth referrals or recommendations are usually the most trustworthy source. Ask your friends on social media, but still do a quick search for research. Good luck! And we hope to hear from you soon.